TV isn't just something you watch, it's something you experience. That's why BeoVision Avant makes a big deal about giving you the best in audio-visual entertainment. The BeoVision Avant was created as a video system, but during its design, the idea came up of making the television a picture on the wall. This has been achieved by deceiving the eye: this is a familiar ploy in the very best of designs. The BeoVision Avant gives you a television that acts like a picture on the wall: a wall you personally position in the room. It has a built-in video which is invisible to the viewer. Everything is operated via the Beo4 remote control. You have full control from the best seat in the living room, and the television turns towards the viewer using the motorised base. 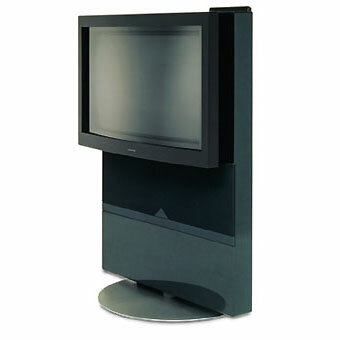 BeoVision Avant - designed by David Lewis - was a totally new concept from Bang & Olufsen and was introduced in 1995. This video system is completely integrated holding a widescreen television, a hi-fi stereo VCR and a couple of active speakers in its attractive-looking cabinet. It was also the first wide-screen TV from Bang & Olufsen ever. Although by the end of the twentieth-century widescreen TVs were taking more and more market share, most TVs still used the 4:3 format. 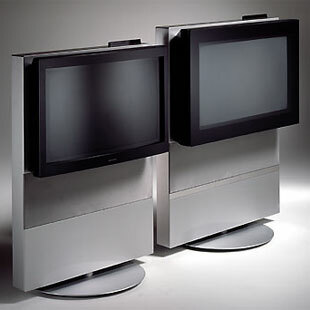 When Bang & Olufsen started planning for this model they originally envisaged to use the same technology then currently used in the MX series but along the way they decided to develop a completely new chassis. This new chassis is much more advanced. The Avant is also a very environment-friendly TV using a lot of recycled material as well being recyclable itself at the end of its serviceable life. The set can also be expanded with several add-ons. For example: picture-in-picture (PIP), satellite receiver and Dolby Pro-Logic or Dolby Digital decoder. The Avant is the pathway to the future of video systems; a whole new concept of the most advanced video system from Bang & Olufsen to date. The widescreen format 16:9 picture tube is used for the first time in the BeoVision Avant. This created conflict between designer David Lewis and Bang & Olufsen's technicians, as the designer could not see the point of it. A new picture tube that could not be filled by the TV picture. Where randomly placed grey stripes on the picture tube were a part of the framing of the picture most of the time. The technicians did not think it could be their fault. Wide format 16:9 was an attempt to consolidate a whole industry around a new market standard. The designer's talk of trimming and stretching the picture to fill out the frame was, in their eyes, simply distortion. There was no ideal solution to the dilemma. Together they had to find the solution that would work best in practice. It was not possible to fill the 16:9 format with a 4:3 TV picture. The necessary trimming and stretching annoyed the eye too much. On the other hand, wide format had a lower limit. In the eyes of designer David Lewis, that lower limit lay in the 14:9 format. The technicians struggled to implement the format with as little distortion as possible. They also checked to see whether designer David Lewis would notice the difference if the format was a little bit smaller. Just a few millimetres smaller on the longer element! But David Lewis saw it straight away. There was a distinct limit in the eye's perception of the transition to wide format, and it lay at 14:9. Finally, they managed to come up with a method that could handle the problem satisfactorily in practice. A method that has subsequently been further developed to implement the 15:9 format that is close to the aesthetic ideal: the golden rectangle. Programmes recorded and distributed in 16:9 are the ideal way of filling the wide format, but the range is still limited. Bang & Olufsen's wide-format TV offers a practical solution to filling the screen with ordinary TV and video programmes. It was created by trained eyes. Symptom: Intermittent jamming of certain types of cassettes in the tape mechanism during eject. Cause: An edge of the cassette or a misfitted label, etc. may catch the lower part of the cassette lid and prevent the cassette from being ejected. Solution: Replace the cassette lid by the new type, which is fitted with two small round knobs on the lower part of the lid. To avoid colour differences the lid is supplied together with side panels and the small triangle (BeoVision Avant TV, service manual pos. 9016). Its standard features were: VisionClear Technology and multi-format picture. It houses a 16:9 widescreen television with automatic picture adaptation, which means that every broadcast, no matter where it originates, is automatically shown with the optimum reproduction, from news reports in standard format, to movies in widescreen. BeoVision Avant features the same functions as Beosystem AV 9000. When you turn it on, first it turns on its motorised stand toward your favourite watching-place. Then comes the sound, produced by four active loudspeakers hidden directly underneath the widescreen, while behind the black curtain the picture adapts to its format and to the lighting conditions in the room, before the curtains glide aside and reveal a perfect picture. BeoVision Avant encourages you to lose yourself in a sound and picture experience - and not in the technology. That's why we hang the 16:9 Real Flat wide-screen on its own smooth wall and conceal everything else behind it - including a set of speakers that will outpace the average hi-fi and a video recorder that tunes itself automatically. You can choose a built-in DVD player or video tape recorder and from a range of five colours. There's also the option of a simplified 66cm version with no integrated entertainment source. Close your eyes and imagine the perfect TV. Open them again and take a look at BeoVision Avant. It's a widescreen TV that's easy to understand, effortless to use and always a pleasure to watch. Though a widescreen TV is never going to be small in size, it doesn't mean that it has to dominate its surroundings. The Avant has a subtle presence and comes in a range of colours that allow it to compliment any environment in which it's placed. At Bang & Olufsen, it is taken for granted that when you watch TV, you want to concentrate on the experience rather than on the technology. That's why the Real Flat screen is 'hung' on its own "wall" with everything else concealed behind. The picture quality provided by the Avant is as close to the real thing as you can get. Its smooth Real Flat widescreen provides the perfect format for movie watching - and together with the exceptional sound creates a spatial illusion that's second to none. Switch on the Avant and it automatically adjusts any broadcast to the optimal widescreen picture - no matter what format it was produced in. News and sports broadcasts are expanded from the traditional 4:3 format into 15:9, while movies shot in widescreen are reproduced in a 16:9 format that's as close to the original cinema version as you can get. And, if you don't like the picture as it is, you can easily change to another format with the Beo4 remote control. Watching movies should be about simple entertainment, not complicated technology. That's why the Avant is available with its own built-in DVD player or video recorder. Its presence is only given away by a discreet lid on the front. All cables are hidden in the back of the set. To ensure even greater viewing comfort, the Avant has its own motorised stand that turns effortlessly through a 70 degree arc. You can program it to turn automatically towards your favourite viewing chair, or use the Beo4 to turn it in the opposite direction. When you switch the Avant off again, it returns silently to its original position in line with your furniture. A red LED display on top of the cabinet gives you a discreet status of the source you are viewing, without intruding on the picture. It also shows the volume status when you adjust the volume level, and other information related to recording, Dolby Surround and so on. On the back of the display is a hidden push button panel for the most frequently used controls. The Beo4 remote control is used to access all the various functions of video-playback and recording, menus, tuning, text-television, picture optimisation, sound properties and so on. Beo4 is designed for user-friendly and ergonomical operation with one hand. The buttons in a star-shape for search, ultra-sharp still-picture, super slow-motion, programme shift and fast forward can be controlled by your thumb only, you don't even have to move your eyes. Beo4 also controls all the latest B&O audio systems as well - it's the key to complete home entertainment! A discreet display on the upper right hand corner of the Avant lets you know what source is playing and a small control panel placed behind it offers hands-on control of all basic functions. This television became the basis for renewed efforts in the US television market which has been overall successful. 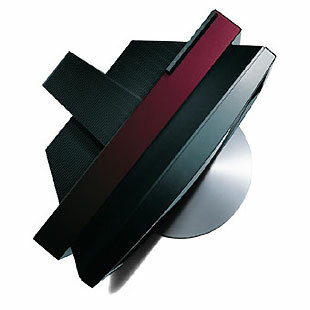 It has been said that 'Bang & Olufsen's products are enchanting' ! And the magic, the good idea, often comes into being in the course of finding a solution to some practical problem. The practical problem here was that there was a short time lag between pressing the button and a picture appearing on the screen. So you would sit and wait expectantly for a little while. The experience of waiting reminded designer David Lewis of a theatre before the curtain went up! Behind the curtain, preparations are being made for the performance. The lighting and sound are adjusted and the actors take their places. The curtain only goes up when everything is ready. The first television to have a curtain was the BeoVision AV 9000. The curtain was a thin steel sheet that was slid to one side by a clever mechanism when the stage was set. Bang & Olufsen's wide-format television, the BeoVision Avant, is equipped with an electronic curtain. From the moment you press the button until the curtain slides away, the technology is busily working unnoticed. No pop from the loudspeakers, no random flash of light from the screen. Only when the sound is ready and the picture is in place can the performance begin. Underneath the loudspeakers is the access to the VCR. The Avant incorporates the same video-technology as the V8000 systems, namely a stereo VCR that can play back recordings of all standards. The video machine has, naturally, record indexing and it can show the elapsed or remaining time of any cassette being played. Dolby Surround is an option, and when installed, Avant can take the place of the AV9000 video system. Another option is a PIP-module (Picture-In-Picture). The perfect picture deserves a sound to match and that's exactly what the Avant offers. A pair of specially developed loudspeaker units - capable of outperforming many traditional hi-fi setups - are discreetly placed below the screen and offer an exceptional sound performance that will enhance the best action-movie or concert footage. The BeoVision Avant features a built-in Dolby® Digital* module that lets you bring the cinema directly into your living room. With a pair of loudspeakers from Bang & Olufsen's BeoLab range positioned at either side of the TV and two more placed at the rear, you can put yourself in the middle of a surround sound experience that's second to none. 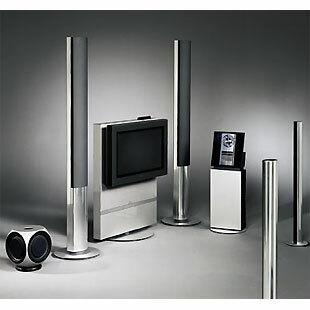 The sound quality of the active loudspeakers can compete with any modern audio system. When the herd of horses approaches your seat from within the widescreen, you can feel the tremble of the horses' hooves - so powerful is the bass. And as a video-master in a Beolink system, Avant can distribute sound and vision all over your home - just as it can play the music from your audio system in its speakers. Press a key on the Beo4 remote and the electronic curtain glides aside to reveal a perfect picture. A theatrical gimmick or another technological leap forward? Actually, a bit of both! In the short reaction time before the curtain glides aside, a comprehensive circuit adjusts contrast levels, brilliance and colour to the prevailing light conditions in the room, ensuring the optimum picture reproduction every time. An anti-reflective coating on the picture tube, as well as on the contrast screen is provided to eliminate reflections from windows, carpets and furniture. If you watch television during the day you've probably experienced the glare and reflections caused by direct sunshine. To minimise the problem, the Avant's picture tube and contrast screen have been given a special anti-reflection coating that reduces reflections by up to 99%. There was a time when watching a movie on TV was a poor imitation of the real thing. But not anymore! BeoVision Avant brings the movies directly into your living room with a smooth, true-to-life picture and totally convincing sound. BeoLab 2 completes this ultimate surround setup and - together with the other four active loudspeakers - allows you to make the most out of the advanced sound opportunities offered by the Avant's built-in Dolby® Digital* module. BeoVision Avant comes as one integrated unit. All you have to do is to plug in the mains and the antenna and you're ready to watch. There are no other visible cords, allowing the Avant to be viewed from all sides - so it does not have to be set up in a corner or next to a wall. It fits nicely into any kind on home, thanks to the range of many available cabinet colours: pearly blue, pearly black, pearly red, pearly green and silver. When the system is turned off, it turns back to its original position, the sound fades away and the curtains glide in front of the screen. Just like being in your own private small-screen cinema! The weight of the Avant’s widescreen picture tube called for new thinking in terms of construction. High density fibre board turned out to be as solid a solution as it is environmentally healthy. To disguise its low tech appearance, it is treated to a high quality two-component lacquer of the same type as is used at the upper end of the car industry. It will not scratch easily, but should this happen, a minor scratch can be polished away using liquid silicone car wax. Bang & Olufsen's preferred supplier for brackets and stands, STBbrackets, have made a range of solutions specifically for this model. Distributed throughout the World by the Bang & Olufsen store network, the STB options add to the diversity of mounting options and positions available. STB have a range of mounting options to allow Blu-ray players, decoder boxes and games consoles to be mounted at the rear of the TV. Woofer: 115 mm - 41/2"